I’ve been curious about the Tyke Toter for a while, so when they offered to send me a seat to demo, I jumped at the chance. I have several friends who have used this seat with great success and one in particular who is constantly posting on Facebook about her bike adventures with her son. The Tyke Toter is different from many other front child seats on the market in that it is just an open seat and handlebar on a post that mounts to the seatpost; there is no harness or backrest. It’s also unique in that it is marketed for kids ages 2-5, whereas most front bike seats work only until age 3 or so. My son’s enthusiasm for this seat (it’s fun!) and the nice spring-time weather means that we’ve done a bunch of test rides with the seat since getting it. After thorough testing, I can say this is a fun, easy-to- use seat for families that have graduated from a “baby” seat. However, due to a scary incident we had with my little boy (read below for details), I can’t recommend the seat for younger kids (2-3) or particularly rambunctious toddlers who might not have the ability to abide by all the safety warnings. Affordable compared to other bike seats on the market. Easy installation and works on most bikes. Can be used for kids up to age 5; most front-mounted seats only work until around age 3. Fun for both parent and child! Safety is questionable—no harness, and child’s foot can get caught in front wheel. One thing I LOVE about the Tyke Toter is how easy it is to install. Unlike the iBert or Yepp Mini that install to the headset, the Tyke Toter connects to the seatpost. 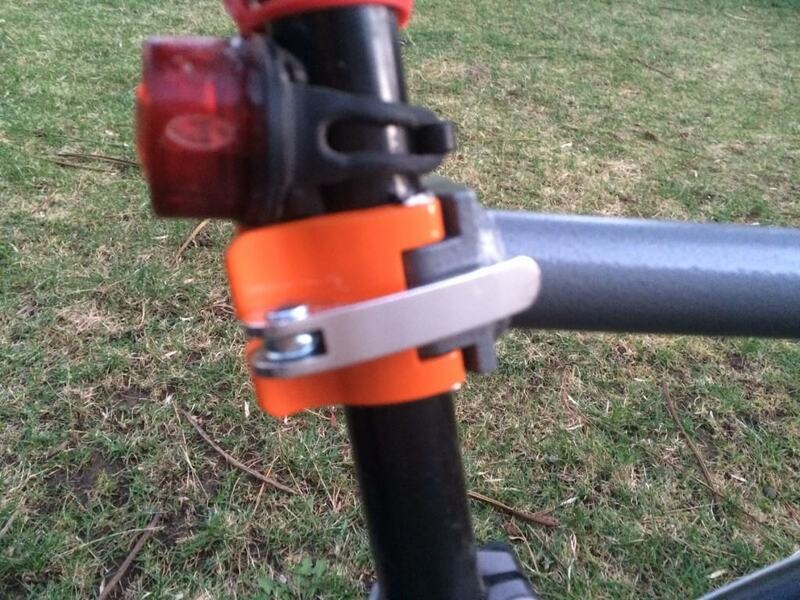 A very easy to use quick-release style clamp secures the seat to your bike in minutes. You don’t need any tools, and there is no hardware left on the bike when you take the seat off. This is a big plus. The seat will work on *almost* all bikes which I think is the exact reason many parents end up choosing the TykeToter. The seat will not work on most folding bikes, and should not be used on carbon seatposts or suspension seatposts (for obvious reasons). A little bit trickier than the seat itself, is the foot peg. The foot peg attaches to the downtube of the bike via a couple of velcro straps and has to be secured REALLY tightly to avoid sliding. The seat comes with several rubber shims to aid in getting the fit secure. This foot peg provides the child with a place to rest their feet. I do think this portion of the design could be improved. As I mention later in this review, there are instances of children getting their feet caught in the front wheel with this seat. Perhaps some foot straps or stirrups (similar to the LOCT), could help prevent this. I’m a bit of a snob when it comes to product quality. I like things that are well-made and that are built to last. This seat meets my expectations for construction. 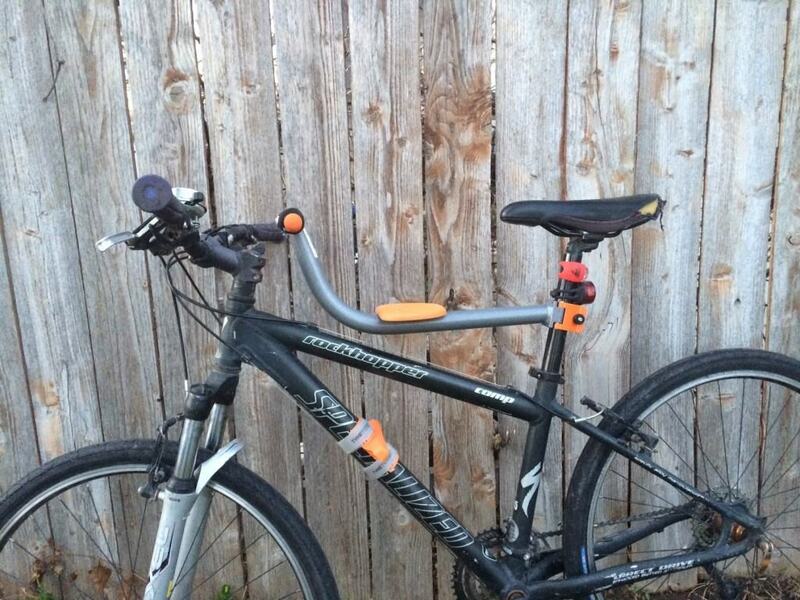 The seat post is alloy, and the seat itself is plastic and hard foam. I would the whole thing to hold up well over time. If that doesn’t make you feel confident enough, the Tyke Toter comes with a lifetime warranty which means you can feel assured that you will be able to use this seat with multiple children. The company also sells replacement and spare parts which I always appreciate. Once you are done using the seat, it should sell well on a site like Craigslist. I was a little surprised about how excited my 3 year old was when this seat showed up on Friday afternoon. Upon his request, we immediately installed it and took the seat for a ride to dinner. The true test of any family bike product is how much fun the child has with it, and the Tyke Toter passed with flying colors. He loved the fact that he had his own handlebars, and we even installed a headlight on it per his request. After our first ride, he begged to take it out again. Like all front mounted bike seats, I love the fact that the child is up front where you can see them and talk to them, and that they get to have an interactive experience while you ride. It’s fun for both parent and child. Our first two trips on this seat were without incident; on our third ride, however, we had a super scary incident. My 3 year old managed to get his foot caught in the front wheel of my bike while we were moving at high speed. We came to an immediate stop but I somehow managed to keep us from crashing. His injury was pretty nasty. 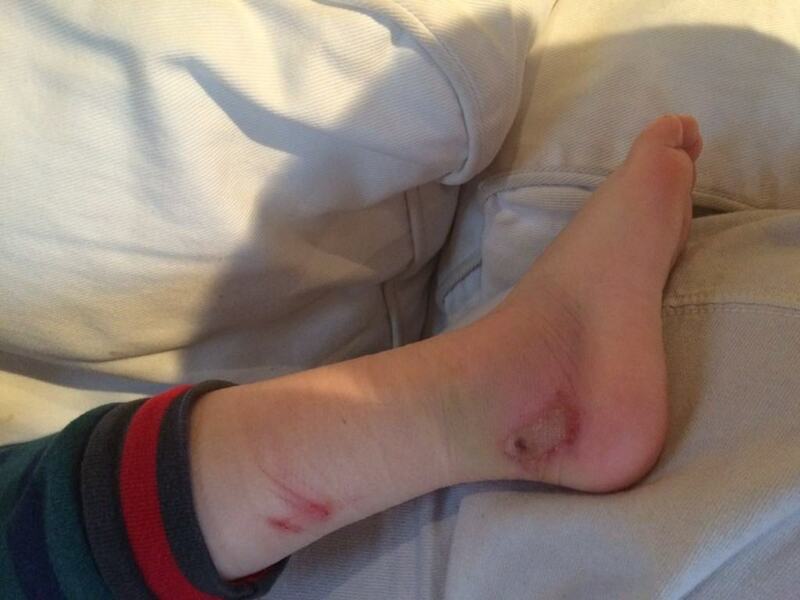 His shoe was ripped off his foot, and he had a deep wound on his heel as well as bruising and swelling. A trip to the Urgent Care ruled out any break or sprain, but the event was traumatic for all of us. As it turns out, our accident wasn’t an isolated incident. When I went online and started reading reviews, it turns out that there were plenty of other parents who’ve had this exact same thing happen to their children. Do I take responsibility for the accident? Absolutely. That said, I do think that parents of young kids who aren’t going to heed a “keep your feet away from the wheel” warning or who are particularly wiggly like my little guy is, should choose a different option. There are also MANY families who use this seat all the time, including people I know, who have never had an incident. After getting over the trauma of our accident, we’ve continued using the TykeToter on a near-daily basis for the last six months. 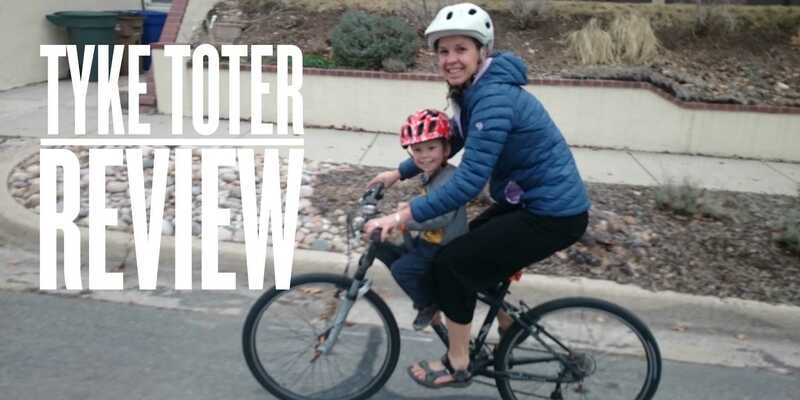 For the most part, we use it on my husband’s bike which has a larger frame and where my sons feet are further away from the front wheel. Also, the accident seems to have appropriately scared our son as he keeps his feet securely on the foot pegs and we’ve had no further problem. We’ve even used the TykeToter on easy singletrack. This is something that is not advocated by TykeToter but has worked well for us and for several other families that I know. It’s unfortunate that we had the accident that we did, but accidents happen when riding bikes. Hopefully our experience can help other families to be more aware of how to use the Tyke Toter safely. Now that we’ve used the seat for six months with no further accidents, I feel like I can whole-heartedly recommend it to other families as an awesome option for riding with their children. I love everything about the Tyke Toter–except the safety concerns I mentioned. Our accident was traumatic, but we’ve had nothing but great experiences with it in the six months since. The seat quickly installs, switches easily between bikes, and is alot of fun for both child and parent. 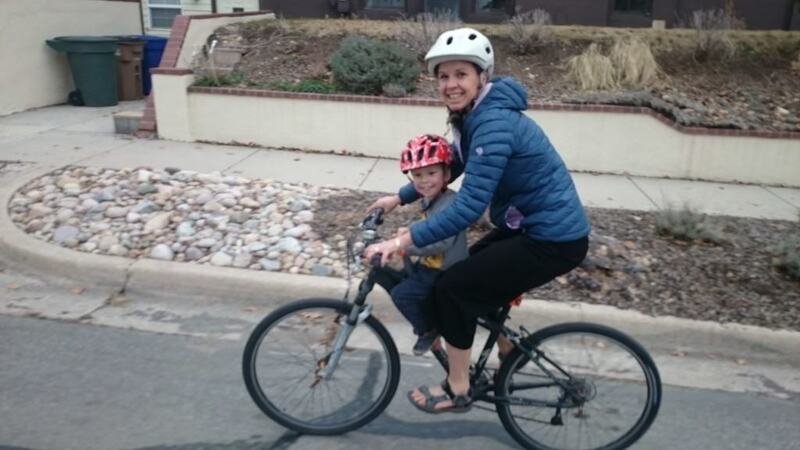 If you feel confident that your child can keep their feet away from the front wheel (i.e. they follow instructions well and aren’t wiggly), then the fun-factor, quality construction, and affordability of the Tyke Toter can’t be beat. Disclaimer: I was provided a Tyke Toter to test for this review, but all opinions are my own.